Camping, hiking, kayaking, Geocaching, photography and anything outdoors!! We were back at HLC this weekend and, as always, it was an enjoyable stay! This campground is now site-specific (meaning that you reserve a specific site prior to arrival) and this worked perfectly for us because we're familiar with the best sites! We grabbed site 43 because it is close to the bath house but very private! We made use of the hiking trails and mountain bike trails this weekend! The trails are well-maintained and clearly marked! This is one of our favorite campgrounds due to the large sites, clean facilities and amazing staff! This is Georgia's newest state park (2013) and it is a beautiful park! The staff is great and there is plenty to see/do! The park is located on Lake Lanier with plenty of opportunities for fishing, swimming and boating! There's even a fish cleaning station (located near the main boat ramp entrance). There are hiking trails, geocaches, a beach area, picnic shelters, cottages and a brand new equestrian trail system! As far as camping goes, there are primitive tent/hammock sites and an RV campground. The RV campground features all paved campsites so it would be tough camping in a tent (no way to stake your tent). Now, the ASPHALT is part of the reason for the review's title, coupled with the fact that this is a new park and tree coverage is a bit sparse for the time being. Once the canopy fills out, it will be shady. We camped in our trusty pop up camper so direct sun is always an issue (non-insulated bunk ends) but a travel trailer/RV would probably fare well (as far as temp goes). We'll be back but in the Fall when it is a bit cooler! The campground hosts were friendly and they kept the bath houses/laundry facilities spotless! This is a beautiful park and we highly recommend it, in the proper weather or camper! Until this weekend, Hard Labor Creek State Park was our favorite GA campground! Sorry HLC, you’ve been bumped to #2 (still great)! Victoria Bryant is hidden on Hwy 327, near Royston and, although a small campground, almost EVERY SITE IS PERFECT! The park offers bicycle rentals, a swimming pool, plenty of picnic areas, multiple spots to play in the creek and some great hiking trails! The campsites are HUGE and there are several extra amenities for campers to use! There’s a volleyball court, horseshoe pits, picnic pavilion and a central fire pit! The park staff is great and the camp hosts are helpful! When we first arrived and began to set up, there was an electrical issue at our site but the park maintenance man had it resolved quickly! The sites do not offer full hookups but there are multiple gray water dump sites in the campground (we used a five gallon bucket for our outdoor sink). We walked across the road from our site and dumped our bucket! The park has the usual stuff to purchase (ice, firewood, etc.) but you can also head to Hartwell and hit the local Wally World if need be. If you're camping in a tent, the tent sites are AMAZING! (see attached image) We've never seen these shelters before! You can even hang your hammock(s) underneath the shelter for a true outdoor camping experience! We enjoyed every minute of our stay here, from the time we arrived to the time we left! One more thing; if you're a golfer, there is a BEAUTIFUL golf course here as well! We camped in our pop up but we'll probably be back to try out the tent shelters!! FYI: Verizon Wireless has full 4G LTE service in the campground…we brought our MiFi Jetpack and streamed Netflix with zero issues! We were back at HLC this past weekend and, as always, top-notch park! We have tent camped for several years but recently upgraded to a new (to us) pop up and we had a blast! We camped at site 26 (one of the newer sites) and it had full hookup (our PUP does not have a bathroom but does have a galley). The site has electric (50 amp and 30 amp service) as well as free cable TV!! The sites at HLC are well spaced and the bath houses are spotless!! The park staff is amazing and the camp hosts are always cleaning up and are available if you need anything! HLC is our go-to spot for a weekend getaway because of the above-mentioned reasons and it is close to home!! We have camped at this beautiful park NUMEROUS times and there is a reason that we keep coming back (actually there are multiple reasons)! HLC has an amazing staff that is there when you need them and not there when you don't! The camp hosts are friendly, the Ranger rides through on a regular basis and is friendly/outgoing (you can tell that he enjoys his job)! The campground is not cramped at all and most of the sites are spread apart to provide privacy! Not long ago, as many of the GA State Parks are doing, HLC swapped over to "site-specific" reservations..meaning that you must choose a particular site when reserving. This is VERY useful if you're familiar with the campground and have a favorite site (such as we do) but it can be a shot in the dark if you're not familiar with the campground. The bath houses/comfort stations are brand new (including laundry rooms) and the camp hosts keep them spotless! The campground roads are newly paved and there are a couple of new sites. There are hiking trails, kayak rentals, a beach area (swimming) and two nice lakes! There are equestrian trails and even an equestrian campground! The park has numerous cottages to rent, a group shelter, picnic pavilions and even a mini-golf course (newly renovated)! Not far from the campground (in Rutledge, GA) there is a Dollar general in case you forgot something that the park store doesn't have. If you've never visited this beautiful park, ou are missing out on one of our hidden gems! We camped here this past weekend (7.13.18 - 7.15.18) but my review will start a couple of weeks earlier. After planning to stay at this campground, and never having visited the park before, we decided to ride up and take a look around. We are members of the "Friends of GA State Parks" and we renew our membership each year. Our membership comes at a price tag of $105 an includes two annual park passes, two free nights of camping and miscellaneous other perks. This particular visit, we forgot our annual park pass so we were prepared to pay the $5 daily parking fee. When we arrived at the campground, we stopped by the store and told the staff member that we had reservations to camp, however, we simply wanted to check out the campground and park amenities before we arrived. I asked to purchase a park pass and the gentleman told me that it was not necessary if we were simply driving through and not staying at the park. I thanked him and we were on our way. After driving through the campground (more on it in a few) we headed towards the other side of the park to the visitor center. As we approached the visitor center, an older gentleman stepped out of the "guard shack" and I told him that we had forgotten our park pass and the other staff member at the building in the campground had told us that we did not need to purchase one to simply drive through. At this point, this particular staff member asked," What guy told you that?" (in a very rude and demeaning manner). I, again, stated that the staff member who was working at the building at the entrance of the campground had told me that and he asked, "Are you talking about the store?" I told him that I was not sure what the building was called, because we had never visited the park before, but it was the only park staff member working at the only building at the entrance of the campground. At this time he became very rude and made a comment to the effect, "Well, if you say that's what he told you then I guess I have to take your word for it!". I told him that we would be more than happy to pay the $5 to drive through the park but he didn't need to be rude. He replied, "Well, YOU don't have to try and guilt me into letting you in for free but you did!" I drove away and we just left the park without exploring any further. Once we got home, I reached out to the park manager and explained to him the behavior of his staff member and he apologized and said that he would handle it. Fast forward to our visit…keep in mind that we have camped at NUMEROUS GA state parks over the years and I cannot remember NOT purchasing a Friends Membership…we have checked into many park campgrounds and never been hassled like we were this past weekend!!! When we arrived (0700hrs) the park had just opened however, there was a sign at the campground store stating that it was closed and the visitor center would open at 0800hrs. We drove through the campground, picked out a site and began unloading our vehicle. At 0800hrs my Wife headed to the campground store to check in and it was still closed so she headed over to the visitor center. The visitor center was open and she told the staff member that we had camping reservations and needed to check in. The staff member (a younger female) asked to see our annual park pass. My wife told her that it was at the campsite (we were in two vehicles) and that we had it but would need one for the second vehicle. The staff member refused to allow my wife to check in until she could see our annual park pass…this has never been an issue at any other state park in GA!!! They always ask if we need a park pass and, if so, they would provide a handwritten pass for the weekend (included in the camping fees). My Wife drove back to the campsite and told me that they had refused to let her check in until we proved that we have an annual park pass!!! I stopped setting up our equipment and we both drove back to the visitor center (on the other side of the park) with our pass. Once inside, I asked the staff member what exactly it was that she needed and she asked for our annual pass and proof of our Friends of GA state parks membership. I asked her WHY she needed to confirm this to check in and she said, "We need that information so you can check in." Once she saw our annual pass (you know the one that we paid $105 for), she allowed us to check in and (here's the kicker) she gave me HANDWRITTEN park passes and told me NOT to use the annual pass because they "prefer" that we use the handwritten ones instead!!! WHY DID WE HAVE TO SHOW OUR ANNUAL PASS IF WE WEREN'T ALLOWED TO USE IT???? After we satisfied the silly rules of check-in, we were informed of the presence of bears (we already knew that because we camp in the area frequently) and we had to sign an acknowledgment that there are bears in the park! She then provided me ith a copy of "rules" that we had to abide by before we received our paperwork! The campsites are very close to each other and there is limited room for your equipment…we have a large tent (16x10), a 13x13 screen room, a 10x10 canopy (our kitchen area) a Jeep Wrangler towing a 5x8 trailer that contains our equipment and kayaks. We also had a second passenger car (Honda Accord) with us. While we were unloading our equipment, we parked the Honda in a small grassy area next to our campsite (there is barely enough room for two vehicles to be parked side by side). As we were setting up, the camp host drove up on his golf cart and told us that we could not park outside of the campsite. We asked if it was even during setup and he told us to move the car (very rude)! So far, our weekend wasn't shaping up to be very enjoyable because of the overbearing staff of the park!! After we got our site set up we decided to go to the lake and fish from our kayaks…we drove to the park office and asked if we needed a trout stamp to fish (we already have fishing license) in the lake and the same female staff member stated, "No, you do not need a stamp to fish but, if you want to keep any that you catch you'll need one"! Now, I don't know about you but, if we catch trout, we're going to cook them!!! I told her that I needed a trout stamp and she informed me that they did not sell fishing license there!!! She proceeded to tell me where we could drive to purchase a stamp!!! A GA STATE PARK (managed by GA DNR) that doesn't have a GA DNR fishing license…wow! Luckily, I was able to purchase my trout stamp on my phone so we didn't need to drive to the next closest town to do so! We fished for a while, paddled around the lake (we didn't catch anything) and returned to our site. As we were getting dinner ready and building our campfire, the SAME CAMP HOST stopped and asked everyone in the general vicinity about a campsite (across from ours) that was set up but had no site marker displayed…we (and everyone else) told him that we did not know who was camping at that site and he instructed us to tell them (when they returned) that they need to display their site marker!!! He gave us an order to enforce the rules of the campground! OVERBEARING! The evening was fine (other than the three-hour monsoon) and the next morning we ventured out to cook breakfast…as we were eating, the SAME CAMP HOST stopped at our site, acted as if he could not read our site marker and asked, "What is your name? I can't read the paper." We told him our last name and he looked at some list on a clipboard…he then asked, "Did you check in at the office?" Seriously???? We were there since 0700hrs the day before and he hassled us multiple times but he couldn't remember us being there???? We told him that we had, indeed, checked in the day before and he asked when we were leaving!! We told him that we were leaving on Sunday, 7.15 and he asked if we had signed the paperwork acknowledging the presence of bears!!!! We told him that we had, indeed, signed the bear paperwork and he finally drove away!!! We have never had such "hands-on" camp hosts! That was the final interaction that we had with the staff (thank goodness) and the rest of our stay was peaceful!!! NOW, onto the park/campground…the park is beautiful, the campground is great (a bit cramped but nice nonetheless) and the overall experience was great. The campground store (trading post) was closed the entire weekend…we asked why they had not opened it and we were told that they do not have the manpower to open it. If you need anything, you'll need to leave the campground and drive across to the other side of the park to the visitor's center…it is open from 0800hrs until 1700hrs (not very convenient). If you need anything else, you'll have to drive back to Clayton to the local Wally World. Other than these silly interactions with staff and the lack of a campground store, it really is a nice park…just prepare yourself to have MANY interactions with the staff! I compare this to staying at a hotel and the front desk knocking on your door several times to remind you of when checkout is, etc.!! FDR State Park campground is amazing! The campground is tucked away in a separate area in the park and very quiet. The sites are large and level. There are several pull-through sites available. If you're into hiking and geocaching, THIS is the park for you! The Pine Mountain Trail is 23 miles of sheer bliss!! There is actually a mountainous area here and the views are amazing! If you're wanting to explore the area, beautiful Callaway Gardens is just a few miles away from the park, as is Warm Springs (home of FDR's Little White House)! We have camped here multiple times and each time is a treat!! One of Georgia's Hidden Gems! We were looking for something to do this weekend and we decided to camp at Florence Marina State Park and explore Providence Canyon. First off, Florence Marina is beautiful from the time you drive through the entrance to when you reach the campground! There's a boat ramp, fishing pier, a private fishing dock for campers and mini golf. The campground is a bit small and some sites are close together but not too cramped. There is a camp store, located in the park, with many items that you may have forgotten to pack, as well as fish bait and fishing supplies! The bath house (comfort station) appears to be recently renovated and is cleaned multiple times per day. The bath house has several showers, including ADA accessible shower stalls. The campground host was constantly cleaning the bath house and picking up trash around the campground. The Ranger patrolled the campground on a regular basis, as did the Stewart County Sheriff's Office. The only downside to our weekend camping trip was the gnats!! The campground host told us that the gnats aren't usually as bad, however, the recent heavy rain is the cause of them being so bad this particular weekend. 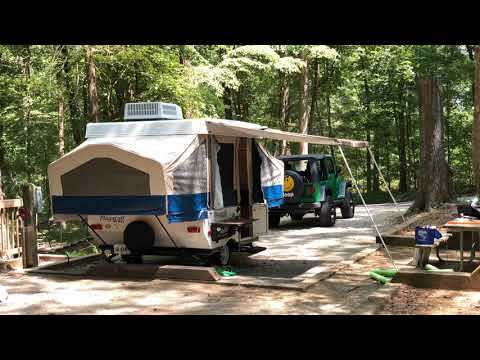 Other than the gnats, this is the perfect place to pitch a tent or set your travel trailer up! Providence Canyon State Park is only 9 miles from Florence Marina and it is a must-see!! We spent Saturday morning hiking there before returning too our site. FYI: There isn't much, as far as shopping goes, in the area so grab your groceries before you arrive! If you must go shopping, Eufala, AL is approximately 24 miles away and that is your closest large store (other than a Dollar General in Georgetown…approximately 16 miles from the park). We have Verizon Wireless and we had 1-2 bars of LTE during our stay…sometimes our signal would revert to 3G and be painfully slow!! Another perk, if you just can't go without, is the sites have cable TV connections…we did not use this service but some campers did. We stayed here this weekend (10/13-10/15) and enjoyed every second of it. The campground is spacious and the majority of the sites are located on the lake! The bath houses are clean, the sites are large and the overall park is perfect! The park is located about fifteen minutes off of the interstate but it feels like you're in the middle of nowhere! 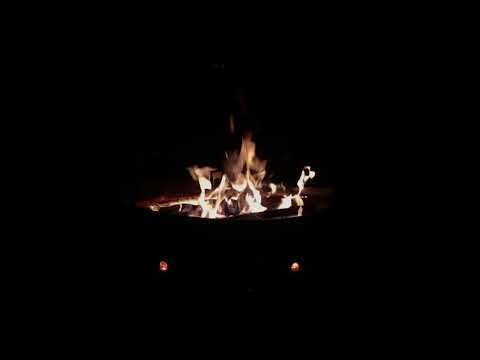 We hiked, geocached, fished and relaxed by the campfire! We can't wait to come back. If you need supplies/groceries there is a WalMart not far away but your best bet is to hit I-20 and head East to exit 190 (Grovetown). There is an Aldi (we love Aldi), WalMart and various places to shop/eat. Oh yeah, people often wonder about cell service in the parks…we have Verizon and we never had any issues with coverage (this was important because we're avid Geocachers and rely on our service for cache listings)! Site We claimed site #20...it was a nice large site situated at the edge of the lake. Hard Labor Creek State Park is one of the Georgia State Park system's best kept secrets! Located just minutes away from Rutledge, GA, HLC seems like a whole world away! Away from the hustle and bustle of everyday life, HLC is still convenient to Rutledge and Madison, in case you forgot to pack something. HLC features hiking trails, mini golf, newly "renovated" campsites that include two BRAND new bathhouses (comfort stations). The comfort stations have restrooms/showers, as well as two family restroom/shower facilities. The comfort stations also feature vending machines (drinks) and a laundry facility! Kayak rentals, a beach/swimming area and numerous special programs are available! Cell phone service is very spotty in the park but that is alright with us, camping is about getting AWAY and enjoying the outdoors, not staring at your electronic devices! If golf is your thing, HLC has a beautiful 18-hole golf course! We spent our three-day Memorial Day weekend at Vogel State Park. We camped in a tent. The staff is very friendly/helpful and the facilities are pristine. Our campsite (#70) was located directly across from the bathhouse and was huge for a "tent" site…we have a 17'x9' tent and the site accommodated our tent, two vehicles and a 5'x8' utility trailer with room to spare! The park has beautiful views and is only a short distance from Brasstown Bald and Helton Creek Falls. The park store had most of the supplies that you would need for camping but, if not, there is a Dollar General located just a few miles away. This is our favorite of the GA State Parks so far!! There are kayak, pedal boat, paddle board and bicycle rentals available!